The government is considering giving extra protections to workers and the environment in order to win support for its Brexit withdrawal agreement. The proposals have been put forward by Labour Leave supporter John Mann. Business Secretary Greg Clark said the amendment showed “Parliament coming together” behind the PM’s deal. But Labour leader Jeremy Corbyn will tell activists that a general election is the most democratic way of breaking the Brexit deadlock. Mr Mann said his amendment, which is backed by a number of other Labour MPs in Leave-supporting constituencies, would open up the opportunity for other improvements to the prime minister’s deal. Theresa May met some of the group on Wednesday and BBC political correspondent Nick Eardley said the move would be seen “as an attempt to win over some Labour waverers”. However he said the Labour leadership “is unlikely to be swayed” and the government’s pledge is not believed to be legally binding. Prominent Brexiteer and Tory backbencher Jacob Rees-Mogg said it was the “right approach” for the government to seek support in this way, but he would still be voting against the government’s “deeply unsatisfactory” deal. Mr Mann told BBC News the amendment was not about supporting Mrs May, but about establishing Labour’s own “red lines in terms of people’s lives”. The backbencher said the amendment would make it more likely for him to back the deal, but admitted it didn’t mean other Labour MPs would be “rushing” to do the same when the vote takes place on Tuesday. Mr Clark told BBC Radio 4’s Today programme: “To establish what Parliament wants and what Parliament supports can be useful. In a speech in Wakefield, West Yorkshire, Jeremy Corbyn will later reiterate his preference for a general election, saying that only a government with a “renewed mandate” would get public support for a withdrawal deal. Labour MPs in Leave areas who would at least consider the prime minister’s deal have previously expressed astonishment that she hadn’t reached out to them. No longer. A face-to-face meeting with the prime minister to explore what it would take to win their support is significant – and part of a wider Downing Street strategy to broaden much needed backing for her deal. But the Labour leadership aren’t impressed with commitments to workers’ and environmental rights which they say wouldn’t be legally enforceable – and unless the prime minister is willing to negotiate a customs union with the EU too they won’t be coming on-side. Labour activists are also keen to see the deal voted down to allow Jeremy Corbyn to argue for an election – and will keep the pressure on his MPs to do so. Even if as many as 20 Labour MPs could be won over by No 10, this wouldn’t be enough to neutralise the larger number of Conservative opponents of the deal. So moves to build cross party support are more likely to limit the scale of any defeat and not avert it. Mrs May, who will host Japanese Prime Minister Shinzo Abe for talks at Downing Street on Thursday, is also continuing efforts to win over sceptical Conservative MPs ahead of Tuesday’s vote. However, Arlene Foster, leader of Northern Ireland’s DUP which has helped the government win votes since June 2017, has warned the PM her deal is “already dead”. In a sign that the party has not been swayed by the government’s promise to give the Northern Ireland Assembly a veto over any new EU regulations introduced under the terms of the proposed backstop arrangement, she accused Mrs May of “wasting time”. The government has lost two Brexit votes in two days. The first defeat limits the government’s financial powers in the event of a no-deal departure. The second forces the PM to announce new plans within three days if her deal fails in the Commons. Senior Conservatives have continued to express opposition to the withdrawal agreement and declaration on future relations, negotiated by Mrs May in November. But Business Secretary Mr Clark said it was time Parliament “recognised its collective responsibility” to back the prime minister’s deal and avoid a no deal Brexit. He said: “We have got a good deal. [It] achieves what is required to avoid what would be a disastrous situation where we move to the most rudimentary terms of trade with our closest trading partners. 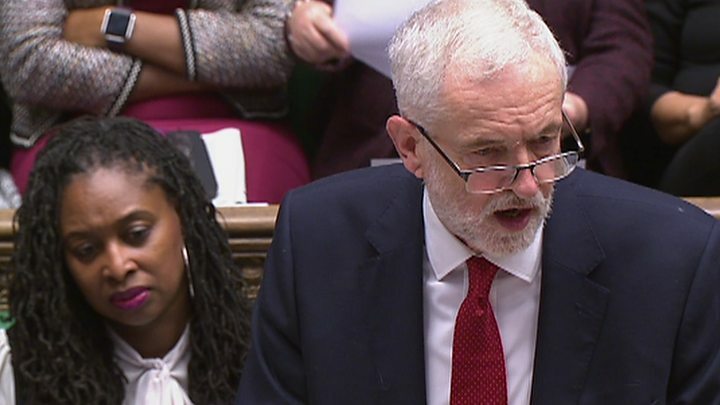 In a speech on Thursday, Mr Corbyn will say that Mrs May – who abandoned a vote on the deal last month – will forfeit the right to govern if she cannot get her Brexit deal through the Commons. “A government that cannot get its business through the Commons is no government at all,” he will say. Labour’s deputy leader Tom Watson told ITV’s Peston programme it was “a question of when not if” the party tabled a vote of no confidence in the government, although he suggested the opposition would wait to hear what Mrs May said in response to any defeat before deciding what to do. The DUP says it will support the government in any confidence vote if the Brexit deal is rejected, making a defeat less likely. Critics of Mr Corbyn’s leadership say he is reluctant to go down this route because, if he fails, pressure will increase on him to endorse calls by many of his MPs – and what polls suggest is a majority of party members – for another referendum. Former Conservative minister George Freeman accused Mr Corbyn of facing two ways at once, behaving like “a Brexiteer up north and a Remainer down south”. Thursday’s Brexit debate will focus on agriculture and employment, with Environment Secretary Michael Gove and Business Secretary Greg Clark leading for the government. Meanwhile, the Japanese prime minister is expected to use his visit to warn that a disorderly Brexit will be damaging for the 1,000 Japanese firms with operations in the UK, including Toyota and Honda. Conservative and Labour MPs who voted this week to limit the government’s financial powers in the event of a “no-deal” Brexit have said Parliament is acting responsibly in trying to prevent this scenario. Many of them favour a closer, Norway-style relationship with Europe, or want to hold another referendum. But Brexiteers have said the developments are meaningless as they do not oblige the government to do anything and the UK will still be leaving on 29 March. Andrea Leadsom, the leader of the House of Commons, told ITV’s Peston on Wednesday it would be an “absolute betrayal” of the 17.4 million voters who backed Brexit, if the UK did not leave as planned.